Applying our knowledge of Lean Construction principles and our experience of professional services eliminates waste and delivers a superior value to our clients. Lean Construction practices provide opportunities for efficiency improvements in a couple of key areas. Lean principles allow efficiencies that are not possible using previous methods. The first area for improvement is the planning process. In the past, project schedules were wildly optimistic, with an average of 55% of work promised in a week actually being completed as stated. This leaves subcontractors waiting for other dependent tasks to complete before new work could proceed. To remedy this problem, we have implemented a Pull Planning process with the trade contractors on a weekly basis. Pull Planning looks at scheduling in reverse. Based on a required end date, we receive critical dates and input from all the trade contractors. 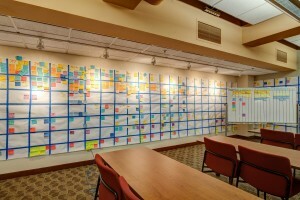 A schedule is developed on a large project board and daily and weekly tasks are identified, color coded and maintained for overall progress.The input received from all trade contractors collectively allows us to schedule the project at a detailed level while maintaining a critical completion date. Scheduling in this fashion allows us to create a predictable workflow and stabilize the project environment. This reduces both time and cost without sacrificing quality. Next, the area for improvement is unitizing specific assemblies or rooms within the design. Modularization coupled with off-site fabrication allows for improved quality, reduced costs, and a reduction in the time for installation. The goal is to improve system-wide performance, improve quality, and allow compressed schedules to be attained.